We have been distracted, and with good reason, by our waaay ongoing San Diego Comic Con coverage, with still a few awesome pictures left to share with all of the Preserve readers out there. This has come, however, at the price of falling behind with all of the other awesome new figures to hit the shelves in the last month or so! 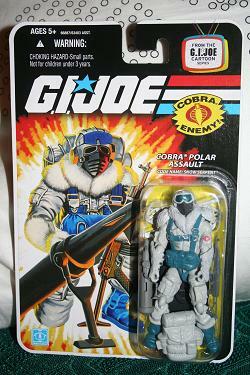 Today we want to at least catch up a little, and feature the Cobra Polar Assault specialist, the Snow Serpent! This is yet another spectacular figure from this very strong wave 2 in the new Modern Era line of figures. Click the image above for a closer look at the sort of troop "...who would parachute onto an ice floe in sub-zero temperatures and then be prepared to march 50 miles with full field pack, assault rifle and anti-tank weapons."